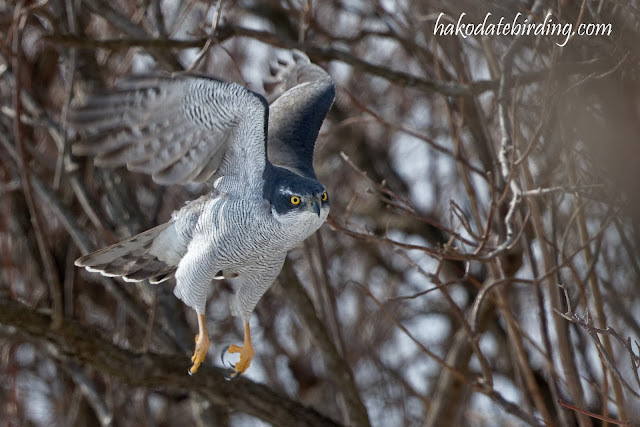 A Goshawk near Oshamanbe 3 years ago today. This species is not especially rare but I don't photograph it much for some reason: just distant immatures against grey skies usually. This adult is probably the best shot I've managed. Goshawk would be a fine chance. Sorry about your 3 months of snow. Yes, I'll bet your inland Lancashire relatives are pretty fed up at the moment. Luckily, and you know how Fylde can different weather wise, we have very little snow just biting easterlies. Never seen a Goshawk anywhere in the UK: even rarer than heavy snowstorms! Northern Goshawk is, in my opinion, one of the most spectacular of all raptors. I once strayed into the nesting territory of a pair and was attached ferociously! Thanks David, this one wasn't as bold as that! Nice shot - only one accepted record of NG in HK.